Didn't realize it was a live feed. as the situation worsens in the rest of the country. 1) He had ordered the recall of the local Berkut forces from Kiev because he could not order them to go into combat against snipers without carrying their firearms. 2) Local authorities are conscripting volunteers in a regional defense force tasked to support the local police forces in case of any attempts by the nationalist insurgents to penetrate into the Kharkov region. 3) A number of documents have been per-approved which could be submitted to the local population in an emergency referendum if the nationalists seize power in Kiev. 4) The regional authorities are prepared to take over the functions of the central government, if needed, and to begin self-financing the region (the Kharkov region is the richest of all the Ukrainian regions and for years its revenues were used to finance the western regions of the country). 5) The local authorities were prepared to declare a state of emergency in the region and were ready to defend it by force of arms. Dobkin also explained why so few eastern Ukrainians were seen in Kiev's counter-demonstrations on the so-called anti-Maidan. 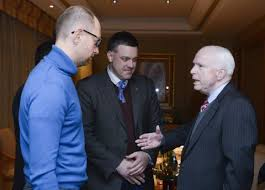 He said that unlike the nationalists who could count on limitless US-supplied monies to cover the huge expenditures needed to bus in a support the nationalist insurgents in Kiev, the eastern Ukrainians had to travel on their own initiative. All in all, I am encouraged by the latest news out of Crimea and Kharkov and I think that I am beginning to discern the strategy these regions are planning to use to deal with the nationalist takeover in Kiev. So The west is paying expenses for trouble making in Ukraine . The UE = UESSR . invading Ukraine not in my name ! It is time to destroy the UE ! 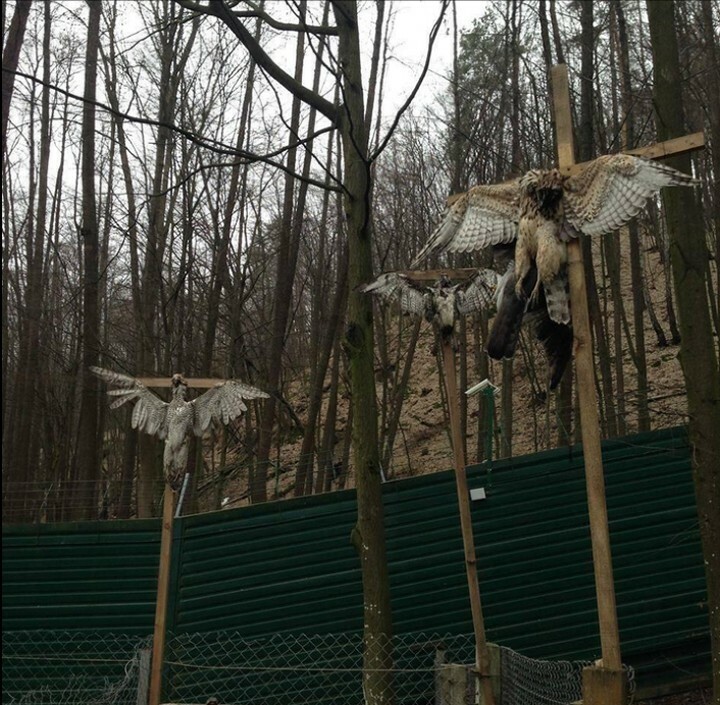 After the Presidential Palace in Mezhgore were captured, "heroes of Ukraine" crucified on a cross three Eagles. (The Eagles called in Russian "Berkut") It gives you an idea what kind of people they are. 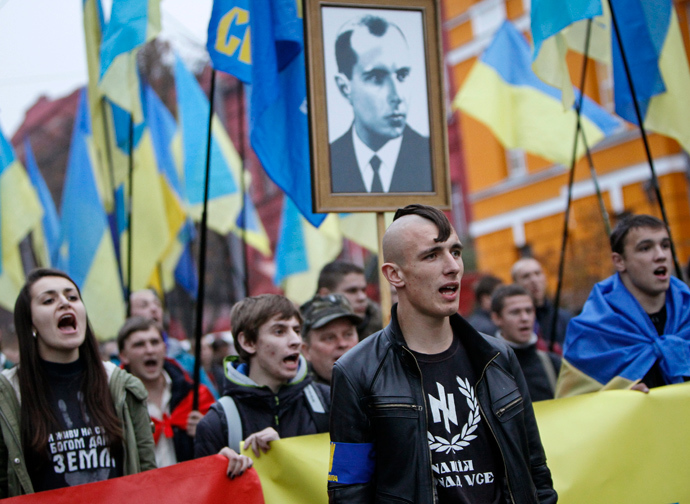 The Anonymous Hacktivist Collective worldwide is partially divided on the issue of Ukraine. This has to do with the western mass media propaganda and the conflicting reports that are coming out of the country. This is sad as some Anons are unknowingly supporting the dark forces at work in Ukraine. Members of Anonymous Ukraine are aware of the internal meddling by the United States, NATO and the European Union into the internal sovereign affairs of Ukraine. Anonymous Ukraine supports peace and the right of the people to self determination. The Bandera Nazis and fascist thugs that are beating and killing police and members of the security services of Ukraine do not represent the will or the wishes of the people of Ukraine. A reshuffled Ukrainian Parliament installed following a coup last week has voted to appoint Arseniy Yatsenyuk as the new prime minister of the country. 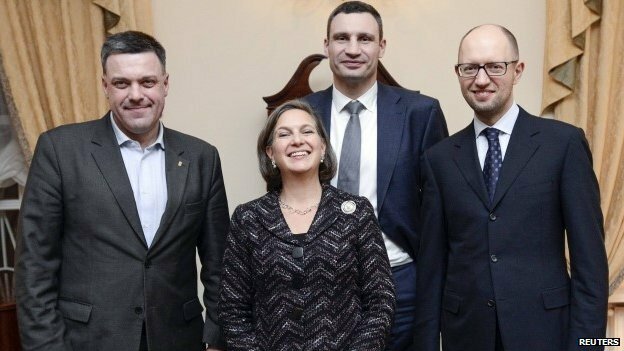 Yats, as Victoria Nuland, the Assistant Secretary of State for European and Eurasian Affairs at the U.S. State Department, called him, is a natural choice. He is a millionaire former banker who served as economy minister, foreign minister and parliamentary speaker before Yanukovych took office in 2010. He is a member of Yulie Tymoshenko’s Fatherland Party. Prior to the revolution cooked up by the State Department and executed by ultra-nationalist street thugs, Tymoshenko was incarcerated for embezzlement and other crimes against the people of Ukraine. Now she will be part of the installed government, same as she was after the last orchestrated coup, the Orange Revolution. Discussion with the IMF is crucial, US Treasury Secretary Jacob Lew said earlier this week. In order to cinch the deal, the U.S. government will sweeten the pot. Lew talked with the IMF boss, Christine Lagarde, about Ukraine as he headed back from a globalist confab, the G-20 meeting in Sydney, Australia. Ukraine’s story is right out of the IMF playbook. The nation’s corrupt leaders past and present – most notably Tymoshenko, who went to prison for corruption and wholesale thievery – have enriched themselves at the expense of ordinary Ukrainians. “Ukraine at the dawn of independence was among the ten most developed countries, and now it drags out a miserable existence,” Communist Party leader Petro Symonenko said last year. The nation’s leaders “signed a memorandum with the International Monetary Fund to meet the requirements of the oligarchs, but on the other hand — to timely pay the interest on the IMF loans and to raise the prices for gas and electricity,” Symonenko said. The Orange Revolution – initiated by NED, IRI, Soros and the CIA – installed a rogue’s gallery of self-seeking sociopaths who further bankrupted a country already seriously debilitated by corruption. After breaking away from the Soviet Union and declaring independence, it was thought the country would “liberalize” its industry and resources, in other words open them up for privatization by transnational corporations and international banks, but this did not happen quickly enough for the financiers and the corporatists. How much involvement did Israel have in a Neo-Nazi coup d'etat ? fighting unit, is pictured in Kiev earlier this month. Delta, a Ukraine-born former soldier in the Israel Defense Forces, spoke to JTA Thursday on condition of anonymity. Roberts said Washington has ignored the fact that Ukraine’s “financially viable part” is dominated by the Russian culture. He noted that Washington may have to “provoke a great power confrontation” in a last-ditch attempt to save face. Ukraine has been rocked by anti-government protests since Yanukovych refrained from signing an Association Agreement with the EU on November 29, 2013, in favor of closer ties with Russia. Ukraine's newly-elected parliamentary speaker Oleksandr Turchyno announced on Sunday that lawmakers must form a national unity government in the Eastern European country by Tuesday. President Viktor Yanukovych has reportedly departed from Kiev, but his whereabouts and legitimacy are still unclear. Yanukovych said on Saturday that he had been forced to leave Kiev because of "vandalism, crime and a coup." "I don't plan to leave the country. I don't plan to resign. I am the legitimate president," he stressed. “I would be worried about whether we can survive the incompetence and the stupidity of the arrogant and ignorant Obama regime. That’s what the world has to worry about at this moment." Putin has not invaded Ukraine. he is in Crimea and the Russian soldiers have always been there. Funny how the media neglected to point that out. There are said to exist 37 pyramids on the Crimean peninsula down southeast along the coast line. 7 underground pyramids – as claimed - were found by Dr.Gokh near Sebastopol (lat.44°36’14” N/33°33′ E). Tens of scientists from different countries explore a place in Sebastopol, where seven ancient pyramids are presumably hidden underground. Archeological dig is underway. The pyramids of a planet are multipurpose. They are the space mechanism of Earth nucleus control, fixation of its space coordinates, spiritual breath of the Earth, control of a biomatter, distribution of a Galactic Power Beam to the planet. Sometimes pyramids act in a role of Space and Time Portals. As is already established by the academician Vitaly A.Gokh, that pyramids of the Earth represent uniform Cosmo energy system. There are 144000 pyramids on Earth varying in size and location. The basic pyramids are grouped in 12 places on all populated continents. All pyramids are connected by power channels among themselves and to a nucleus (Crystal) of the Earth and are controlled by last. 12 basic groups of pyramids, control, in turn, another 12 small groups, which influence in aggregate all pyramids of a planet (12*12=144*1000=144000). Each of 144 basic pyramids control work of another 1000 pyramids. 144000 pyramids of the Earth correspond to 144000 Biblical Chosen (Selected) (Revelation by St.Joan). Each pyramid acts as energy and spiritual channel necessary for successful Quantum Transition. Thus, each of 144000 Chosen has a pyramid of "his own". Each group of pyramids is one of twelve Basic Earth Chakras! Also 12 groups of pyramids correspond to 12 constellations of the zodiac, 12 - spiral DNA molecule (control disclosing of spirals), 12 months of year and 12 biblical Israeli tribes, 12 apostles, etc. Each constellation of the zodiac cannot control the pyramids directly, since they not always are in a zone " of direct space visibility ". The certain stars - retranslators therefore are used. Each group of Pyramids renders specific space influence on environmental space. It is possible to ascertain, that the horoscope of a man, is determined not only under what star the man was born, but also in an operative range of what group of pyramids he or she was born. The pyramids of the Crimea are in this respect unique: the part of them corresponds to Aquarius, part -to Pegasus, and part - to Andromeda. The map of Crimea contains mirror reflection of some sites of the star sky! 12 basic groups of pyramids of the Earth are subdivided into two groups: reflective (transmitting) and receptive (accepting). Six groups are reflective, six - receptive. However, unique feature of the pyramids is that they have a feature of energy adaptivity - i.e. they could adapt to concrete conditions. If it is necessary to accept energy - they will accept it, if it is necessary to give back - they will reconstruct and send it back to space. The pyramids of the Earth are called to play one of key roles in forthcoming in several years Poles' shift and subsequent Quantum Transition. During fast shift of Poles on approximately 6300 km North Pole of the Earth will be moved to the area of Tibet, and Southern - in the area of Paskha (Easter) Island. Some time back brand new spiritual energy of the Sixth Race began to come on the Earth has activated Earth celestochannel. The underground lake under Chatyr-Dag Mountain in the Crimea, Ukraine serves as a mirror - receiver of this energy - " Maitreya waves (or breathing) ". Besides, each zodiac epoch has managing group of pyramids changing cyclically every 2160 years. The pyramids of epoch of Pisces - Egyptian, has already transferred their star relay race to the Crimean pyramids, which will play in turn role of leading pyramids of the Earth till 4161. The main obstacles in way of penetration of Maitreya waves on Earth - closed pyramids' channels and closed consciousness of the people as well. The pure spiritual energy of Space, adjoining with low-frequency vibrations of human consciousness causes mutual annihilation. That is shown on the physical plan in the form natural cataclysms. To think, to speak and to work, spiritually, in Light of Love and Truth - is a moral obligation of wise in order help to the Earth in hardest for all of us period of Transition. Twelve Gospel Apostles mean esoterically 12 pyramidal complexes and pyramidal ducts of the Earth. Thirteenth (or the first) should be considered as Christ. Thirteenth (or first) group of Pyramids - central, controlling - Tibetan Pyramids and their main Pyramid - mountain Kailas, being also central (and largest) Pyramid of the Earth. Its height is comparable to radius of the Earth and is equal to the length of Poles' shift. According to the Israeli website alyaexpress-news.com, a unit of 35 armed and masked men and women on Maidan square is commanded by four former Israeli Army officers, who wear a kippah under their helmets. 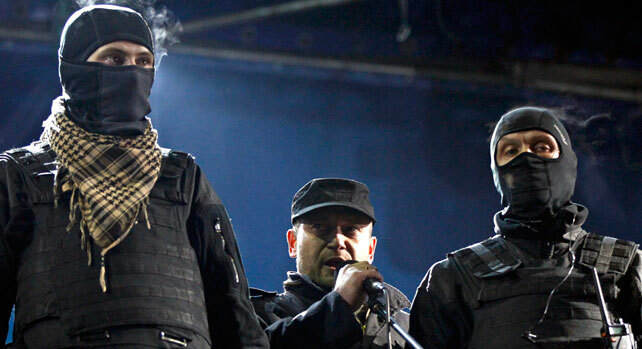 The site claims that these former officers, who live today in Ukraine, joined the movement since the beginning of the events alongside the Freedom Party (Svoboda), although the latter has a reputation for being virulently anti-Semitic. Conitnues at the website above . Note also that the new illegal government wants to put jews oligarchs in charge of Ukrainan regions . 10:00 A.M. Russian lawmakers are working on a draft law to allow the confiscation of property, assets and accounts of European or U.S. companies if sanctions are imposed on Russia over Ukraine, RIA news agency said on Wednesday. RIA quoted Andrei Klishas, head of the constitutional legislation committee in the upper parliament house, as saying the bill “would offer the president and government opportunities to defend our sovereignty from threats”. He added that lawyers were examining whether the confiscation of foreign companies’ assets, property and accounts would comply with the Russian constitution but said such steps would “clearly be in line with European standards”. The truth is coming out and the EU politicians come out as psychopath and warmongers .